Available in a convenient, fast-acting capsule that targets joint and bodily pain while supporting immune system health. NuMedic Salicin-B Intensive Care is available in a fast-acting capsule form, which releases beneficial willow bark extract, powerful boswellia extract (5-LOXIN®), turmeric extract, and VitaBerry® High ORAC Berries. Together, these natural ingredients promote immune system health and improved mobility through the release of antioxidants and enzyme inhibitors. NuMedic's Salicin-B Intensive Care contains white willow bark extract, 5-LOXIN® boswellia extract, turmeric extract, and VitaBerry® high ORAC Berries. White willow bark extract is known for its natural ability to reduce inflammation, pain, and discomfort, making it ideal for those who experience chronic joint pain or arthritis. Similarly, boswellia extract has been used to improve symptoms of asthma and chronic pain, including osteoarthritis. NuMedic's Salicin-B™ Intensive Care also features high ORAC berries and turmeric extract, both of which alleviate inflammation and pain. By itself, your body may not be able to alleviate the pain or inflammation associated with injuries, arthritis, asthma, and other diseases. 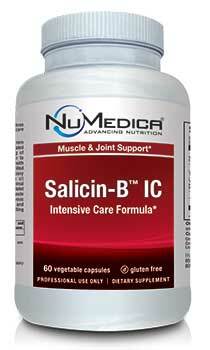 However, NuMedic's Salicin-B Intensive Care unique combination of natural pain relievers targets inflamed areas of the body while infusing powerful, disease-fighting antioxidants into your system. Because it contains 5-LOXIN®, a type of boswellia extract 12x more potent than its traditional form, NuMedic's Salicin-B Intensive Care promotes overall health and offers powerful pain relief. To prevent immobility caused by arthritis or other painful disorder, many individuals have entrusted natural ingredients, like white willow bark, boswellia extract, and turmeric extract, to provide essential antioxidants while reducing pain and inflammation. Particularly helpful for those suffering with chronic conditions, NuMedic's Salicin-B Intensive Care promotes mobility and independence naturally. Directions: Take two capsules twice daily or as directed by your healthcare practitioner. Caution: Do not use if allergic to salicylates or aspirin. Do not combine with aspirin or anticoagulants. Keep out of reach of children. † 5-LOXIN® AKBA Boswellia serrata extract. 5-LOXIN® is a registered trademark of PL Thomas & Co., Inc. International patents pending. Deep penetrating cream for minor aches and discomfort. Powerful, all natural, nutritional supplement offering support for healthy muscle function to relieve minor muscle aches & discomfort.